I have been using Royal TS since version 3 of the application. When I opened it up recently I was greeted with a message that the application has been updated to version 5. Well I’m always interested in the newest versions of applications, especially those that I use on a frequent basis, so I started reading the release notes for version 5. At that point nothing jumped out at me saying that this required a full version update. That is until my eyes landed on the line Dynamic Folders and credentials. This piqued my curiosity so I downloaded version 5 and started looking at the documentation for the new RoyalJSON specification. Beyond the specifications documentation, there are also examples for all of the supported script interrupters inside of RoyalTS itself. The examples do not show how to dynamically create JSON files but instead show how to create static ones. This is useful for learning how to create your object and is a good first step and a nice welcome example from RoyalTS. The example provided by Royal for PowerShell shows how to create a credential object, a folder, and a connection to a computer through the terminal. Using this as the basis with the knowledge of PowerShell I quickly created a script block which queried my test domain for my servers under the Enterprise Servers OU. Using the example provided by RoyalTS as my guide, I noticed the hash table created by the example script had a key of Objects and the value was the array of computer objects in it. Doing this allows for the JSON output to be formatted correctly for RoyalTS. Something I found (and didn’t see documented - or maybe I missed it) is that RoyalTS will automatically create the full path for a computer object for you if you put the computer in a path that does not exist. In the case of my script - I am putting the computer in the same folder as it is found in Active Directory and RoyalTS is automatically creating the folder path for me without me having to define it first. Notice that the two folder structures match. The OU TestOU is not present in RoyalTS since no computer is defined under there - which is a result of my code and not RoyalTS. If I had written code to first generate the OU structure based on Get-ADOrganizationalUnit the items would indeed have been present in the OU list in RoyalTS. By using the properties defined in the RoyalJSON specification, we are able to set the credentials that each connection uses either by name, id or explicitly. 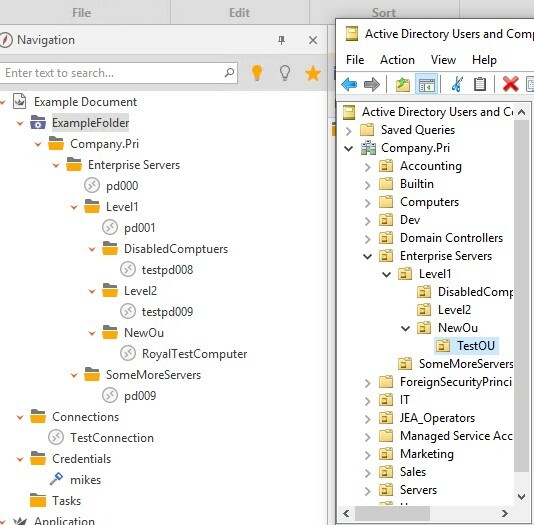 In the below video, I go over how to create a RoyalTS dynamic folder and shows that it can query AD to create a dynamic list of connections. Sometimes you have to save credentials when running a scheduled task. There are ways to save the credentials in the windows credentials manager, but sometimes you need to store them as a file. In this post I go over how I go over how I store credentials securely in a file. While there are some limitations and things to remember, this is useful for working with scheduled tasks. WinRM is extremely useful when using Windows Powershell - but what do you do when it is disabled? How do you work with PowerShell on remote machines without breaking security policy? I explore a method to be able to do this using existing remote technologies which will not make security upset at you. This past week I was approached by a coworker that had a script which was timing out in less than 30 minutes - the default ADWS timeout. They were using get-aduser with a few conditions in the filter parameter, resulting in only about 30 user accounts being returned. The query was randomly timing out and there was no immediate clue as to why in the error message. This is being run against a complex ad environment with 80k+ users in the environment. After doing some searching around the error results from the timeout between paginated results. After finding this page the answer became obvious. Because there are so few results being returned due to the filter in such a large environment - and the default pagination size is 256 results the timeout of two minutes is being hit. In this case - since there were only 30 or less results the pagination limit of 256 was never hit and therefore if the query took more than two minutes an error was returned. The simple solution is to reduce the number of results returned on each “page” of results by setting the parameter ResultPageSize to a lower number. In this case, because they were only expecting 30 / 80k+ users to be returned we set the ResultPageSize parameter to 1. This means that for each result returned, the two minute time limit is once again refreshed preventing the query from timing out. HPE Synergy and OneView not only allows you to create server profiles automatically but also set a one time boot options even on UEFI servers and boot to ISOs which are stored on a web server to install the operating system on multiple servers simultaneously.